January 20, 2011 - The Federal Aviation Administration has announced that the number of laser strikes on airplanes in 2010 nearly doubled from the previous year to more than 2,800. This is the highest number of incidents since we first began keeping track in 2005. Pointing a laser at an airplane is not a harmless prank, it is a technological assault on the pilot and a serious safety risk to passengers. Yet laser event reports have steadily increased since the FAA began collecting information from pilots. Reports rose from nearly 300 in 2005 to 1,527 in 2009 and 2,836 in 2010. An American Airlines 757 is on final approach to Boston Logan Airport?s Runway 4 R after flying for nearly three hours in nighttime conditions, when the captain is suddenly hit with a dazzling green laser light that obliterates his vision! The laser beam had hit the captain?s left eye with such intensity that he feels as if he has been ?punched in the eye.? He ducks down, closes his eyes, and tells the first officer he has been hit by a laser beam and not to look at the light. The pilot experiences pain, spasms, and spots in his vision. The flash was so bright that he believes the aircraft may be the target of a terrorist attack! So distraught by the event that occurred and visibly shaken, he gives up control of the aircraft to the first officer, who, fortunately, has not been hit by the laser beam and is able to land the plane successfully. The captain?s symptoms persist in the hotel that night. Upon waking in the morning, he perceives that the vision in his left eye is noticeably more blurred with or without his glasses, and his ?eye hurts and feels strained.? The pilot goes to an eye doctor that afternoon and is diagnosed with accommodative spasm, sluggish pupil responses, and increased light sensitivity, which continue on for several days before finally clearing up. For a while, though, the pilot thinks that his flying days may be over. This laser incident is fictitious but is based on actual events and personal interviews with pilots that have been exposed to laser beams while flying here in the United States. Although lasers have many legitimate outdoor uses, such as in astronomical research, deep-space communications, orbital satellite imaging, and outdoor displays to attract and entertain the public, the misuse of laser devices poses a serious threat to aviation safety. Aviators are particularly vulnerable to laser illuminations when conducting low-level flight operations at night. 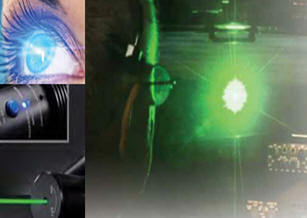 The irresponsible or malicious use of laser devices can threaten the lives of flight crews and passengers. As Federal Aviation Administrator Randy Babbitt wrote in a blog post last month, "Some of these exposures have required pilots to have to temporarily give up control of an aircraft to their co-pilot or abort a landing. There have also been reports of people shining lasers into air traffic control towers." That's why, says Administrator Babbitt, ?The FAA is actively warning people not to point high-powered lasers at aircraft. We continue to ask pilots to immediately report laser events to air traffic controllers so we can contact local law enforcement officials.? Law enforcement has and will continue to take aggressive actions to put a halt on aircraft and air traffic control tower laser strikes. Some cities and states have laws making it illegal to shine lasers at aircraft and, in many cases, people can face federal charges (see Medford Man Convicted Of Lasering Into A State Police Helicopter). ?We are committed to raising awareness of this important safety issue. And you can help. If you see someone pointing a laser at an aircraft, please contact your local law enforcement officials. ?